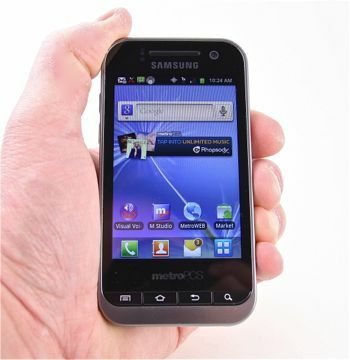 Samsung brings a mid-range Galaxy-class device to MetroPCS's network in the Attain 4G. This simpler smartphone packs some surprises, along with some disappointments. MetroPCS's latest LTE 4G smartphone is the Samsung Galaxy Attain 4G. It lands in the middle of the food chain in MetroPCS's lineup, and offers a good mix of features for the price. Android fans that want a pre-paid phone should take a look at the Galaxy Attain 4G. The Galaxy Attain is the result of trying to make a 4G LTE phone really affordable, for a prepaid carrier like MetroPCS. It's a cute little phone, with that blazing fast LTE inside. MetroPCS today announced the Samsung Galaxy Attain 4G, a new Android smartphone that supports MetroPCS's Long Term Evolution 4G network. The Attain 4G runs Android 2.3 Gingerbread, has a 3.5-inch display, and is powered by a 1GHz processor. MetroPCS today launched Rich Communication Services, or RCS, under the joyn brand. Joyn is a standards-based Android application that collects and merges messaging services, such as IM and SMS. MetroPCS today announced that is once again offering a $40 plan to all 4G LTE smartphones within its portfolio. This plan had previously been available only for the Samsung Craft, which MetroPCS ceased to sell in December. From the "we don't give a crap" dept. That mis-aligned mail icon is indicative of the overall quality Samsung puts into their phones. All of the samsung phones / electronics that I have ever bought have not only lasted a long time, but work exceptionally well. I wonder if call quality is being sacrificed to due their limited amount of spectrum. They're sharing the same with LTE right? My friends have noticed that voice quality has deterioriated in the last couple of months in NYC. Even with full strength signal mind you.